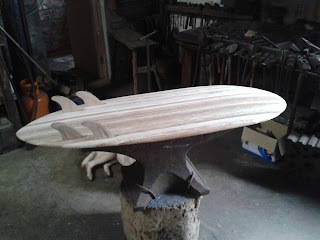 I shaped the Agave blank last week, a task I performed with all the existential angst of a bird wearing eau de corpse cleaning the teeth of a dozing croc. I learnt a few things though…firstly a good respirator is a wonderful thing and a few simple precautions (working outdoors, wearing a long sleeve shirt etc.) go a long way in making the work more pleasant. Working with this wood again distilled my existing thoughts on the intricacies of harvesting and milling Agave. Making a good quality, even density blank requires a certain amount of knowledge and timing. A couple of years ago a carpenter friend of mine harvested and milled some Agave. He picked only the vigorous, green, crazy horny, springtime-of-their-lives, stems; planked them immediately and dried them. The resulting wood was, to extend a metaphor, virginal white, rot free, as light weight as foam and evenly dense. My new blank was less virtuous, more Mary Magdalene than Mary mother of God. It united the pale rot free planks with dense brown strips cut from close to the surface as well as red and grey planks where the decay had set in. Trying to shape the latter with a block plane was like attempting to plane a sponge and although the resulting combination of colours is deeply pleasing, the lack of uniformity in desity made shaping trickier than it needed to be. Still, I think it all worked out of in the end. My new board is a slight departure from my usual, single concave, planing hull obsession. Its a 4’9” quagg. Flat bottomed stand up paipo. Flat bottomed girls make the rockin world go round!